On Monday I picked up a box of produce from Black Sheep Farms. My summer “job” is to turn their tasty produce into a tasty dinner. It has been fun to look at food from a different angle; I want to provide recipes that will use the food in a way you may not have thought about before.Â This week my focus will be on how to use: baby chioggia beets (with greens intact), sugar snap peas, broccoli, Thai basil, garlic scapes, and mulberries. The baby chiogga beets and greens, Thai basil, and garlic scapes are all new to me so I have my work cut out this week. I wanted to use more than one of the ingredients together in a recipe. That way when you pick up your CSA box or you find them laying together at your favorite farmers market booth, you could use them up on a single recipe. My first recipe for the week I decided to use the baby chioggia beet greens and the garlic scapes together. Baby chioggia beets are an Italian heirloom variety of beet. When sliced you can see the beautiful alternating red and white rings, because of this chioggia beets are also known as Candy Stripe beet or Bull’s Eye beet. When storing the beets I read it is best to separate the greens from the beet –the greens will draw out moisture causing the beet to shrivel. Cut the green off about 1-2 inches above the beet. You will want to use the greens up right away, as they won’t keep as long as the beets. Garlic scape is a relativity new vegetable/herb to me. The first time I heard about it was last year when my friend Jessie put garlic scapes on her pizza. 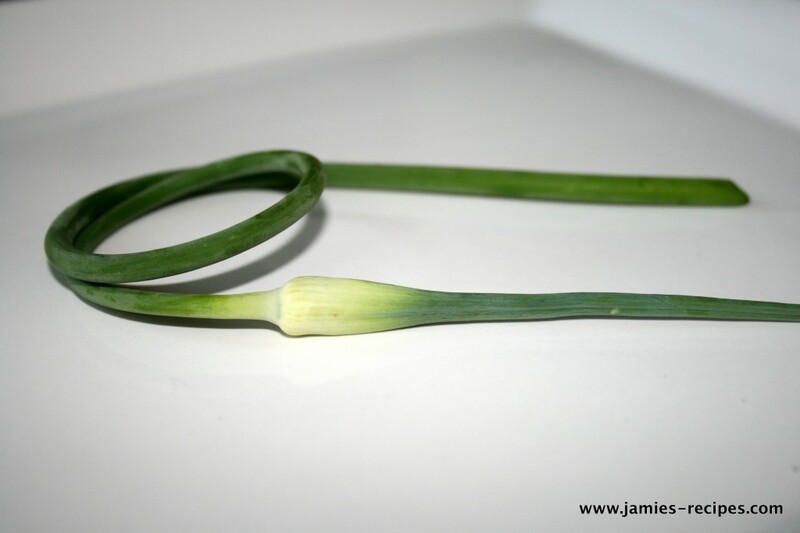 Garlic scapes are the stem and flower part of the garlic. When the scape is removed the garlic bulb can focus the energy on growing and maturing a bigger bulb. The scape reminds me of a curly green onion that is solid like asaparagus. These are delicious! 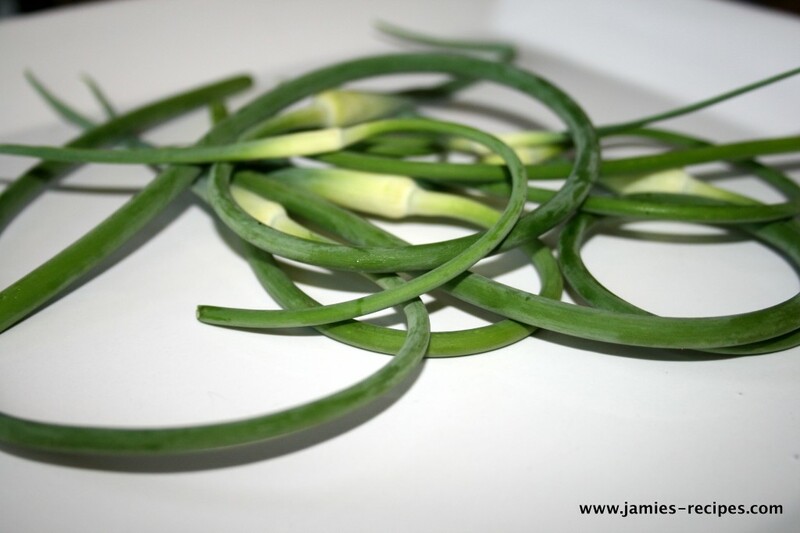 I wish you could find garlic scapes all year round. When I hear the words “greens” and “garlic” the first thing that I think of is pesto. It is a terrible obsession of mine. I LOVE pesto. I made pesto with the last supply of produce from Black Sheep Farms, so I really didn’t want to toss the beet greens and garlic scapes into the food processor for another pesto recipe. Instead I decided to do a deconstructed pesto –all the elements of pesto but the ingredients remain separate and intact. Is that cheating? The deconstructed pesto received three out of four stars from our family. My husband thought it tasted a little fishy –I think that was because I was out of olive oil and used canola oil instead. My little girls (ages 3 and 20 months) really like the dish, so that makes it an automatic winner for me. I served this pasta with my Parmesan chicken bites, I think that sauteed sea scallops would go wonderfully with it as well –that is if meat is your thing. Cook pasta according to package directions. Heat skillet over medium low heat. Add oil, greens, garlic scapes, salt & pepper. Stir everything around. Cover for 3-5 minutes until everything is wilted. Add in chopped walnuts. Drain pasta. 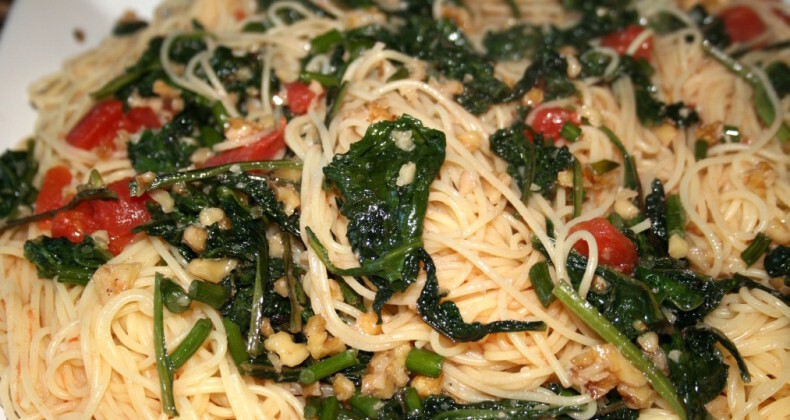 Toss tomatoes and greens with the pasta. Sprinkle with Parmesan cheese when ready to serve. ENJOY! this looks really good. i haven’t made pesto yet this year, i’ll put it on my to do list. Great idea! 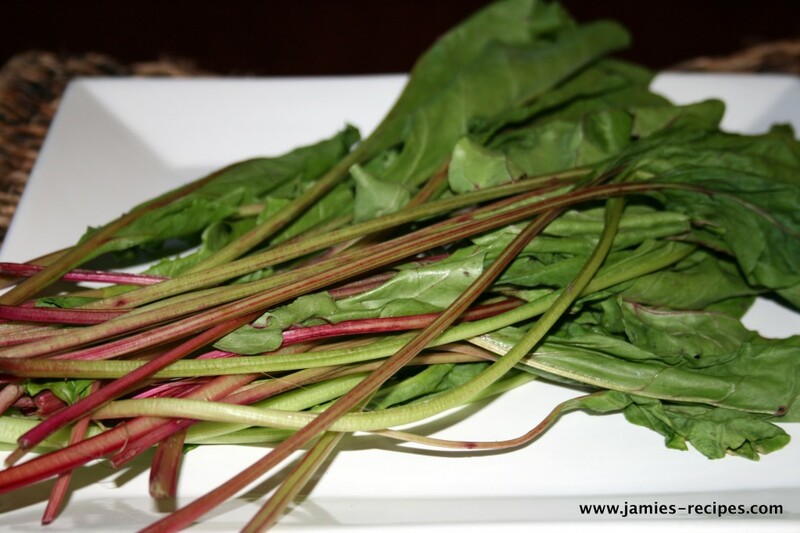 I have beet greens and scapes on my counter right now, waiting for a delicious recipe. I think I will do this tomorrow. So this is what garlic scapes look like! Finally I see a nice close up image of it. I’m so so envious of your farmers market!